I really don't know how I deserve such generous and kind friends. I am richer in so many ways from knowing women that share the same hobby and like doing the things I like, too. My friends from all over the world are so generous to me with comments and encouragement and occasionally sweet treats that my family (and I) marvel at! Jane has been a good friend for a long time and she is as generous and nice as they come. How did she know I was out of peeps? And look at that color! See the sweet pink rick rack she sent next to the green. Now isn't that is a quilter's eye for color. When I opened the box my daughter Whitney was home and I could see her eye the incredible beehive pot with desire. Whitney loves bees and is making her own collection in her home on her china hutch. She sometimes likes to "borrow" but she's not getting this! Thanks so much Jane. For everything. Jane sells great fabrics. Go see what she's up to. Candace has been a friend for a while now, too. These sweet women found me somehow and I'm so grateful they both did. Candace sent me an Easter bag and note pad. Super cut. Look at that fabric! 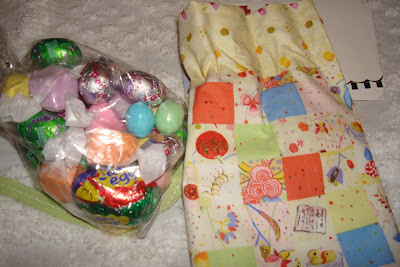 Inside the bag was like getting my Easter basket on Easter morning and those little fun feelings came back to me of being a kid with a pile of Easter candy and more. Candace picked out that fabric for the bag just for me. Isn't that a great idea. Love it. Thanks Candace. I hope it is ok to copy this idea sometime. Adventures in Alice Land is having her 200th post celebrations with lots of gifts and treats. Aren't bloggers so incredibly generous. Go say hi and try for the prizes but not those 5 fat quarters! I want them!! Another sweet thing about making friends on blogs, I make knew ones all the time like dear Alice. And now the not so sweet. I've been unpicking quilting from a table runner. I probably should have left it, junked it, and started over. Time wise I'd have been way ahead. I really don't mind unpicking but when it runs into a 2-day event, it gets old. Thanks to Tricia for helping me tonight while we sat at Alpine Quilts. See. Even in my problems, I have the sweetest friends! I worked really hard this past weekend on several things but I can't blog about any of them! Yet. I'm continuing to work on projects that will be at the May International Quilt Market so I don't have new things to show this week. But, spring is coming so we did a little changing of the quilts at my house. So be warned. . . repeats below. 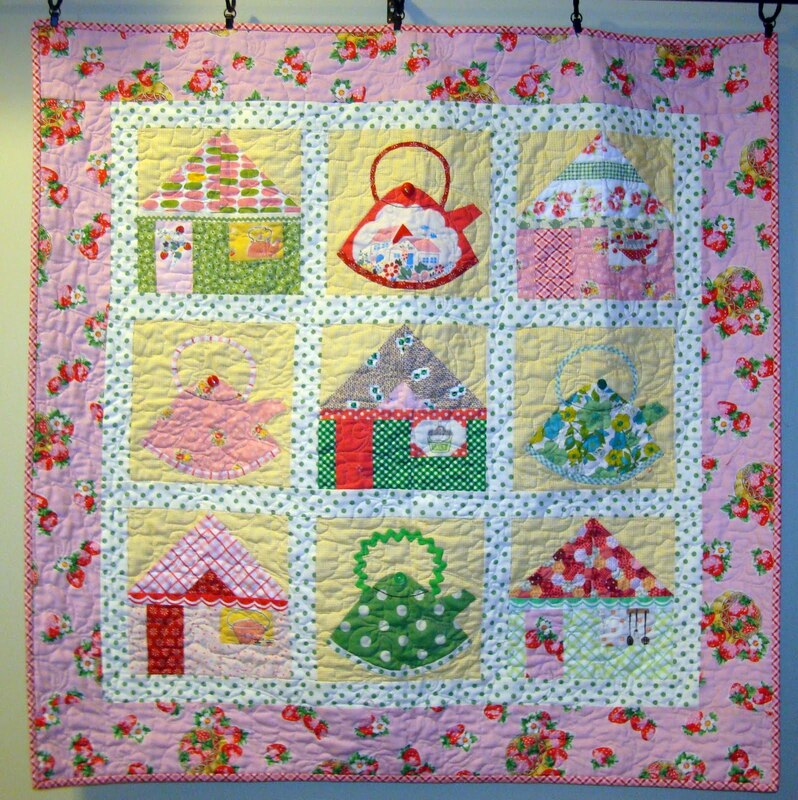 I put up a "Kettles in the Kitchen" wall size quilt up in my sewing room. 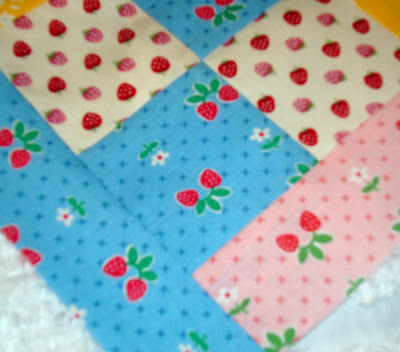 After buying giant sized strawberries at Costco this weekend, it just seemed to be the quilt to enjoy. I really need to make freezer strawberry jam this year. I hope this reminds me as strawberries become more plentiful. 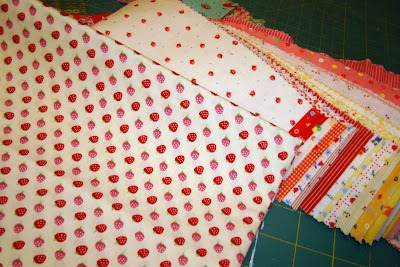 I just love this strawberry print. And since I've been waking up to birds chirping for the past week I think my "In the Leafy Treetops" quilt is just right to be up in my entry way to welcome April this week. 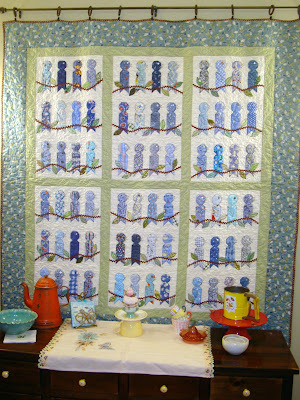 The birds in the quilt always make me feel good. I've been watching and listening to birds outside my sewing room window of late. They know spring is coming and I believe them. I'm starting to see just the little brown nubs on a few of our trees that tell me buds are developing. I can't wait for the days that I can open the windows and let a little spring air inside. On a side note . 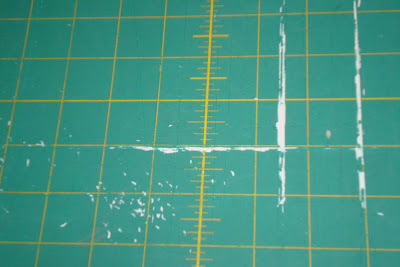 . . this is what my cutting mat is looking like. I have grooves worn in and I've flipped it over previously so they are on both sides. I think it might be time to get a new mat. But I've been waiting for a pretty red or yellow mat to come out. Whats up with green for most mats? Is there a reason for green? I'm kind of sick of this color and wish I had something snazzier to cut fabric on. Is there something else out there? Sew Mama Sew occasionally has designer packs with fabric picked from their cast of Board Members (speaking of board members Jacquie recently was added to their board, congrats Jacquie). 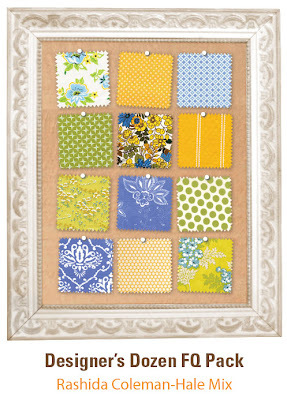 Their latest designer pack features Rashida Coleman-Hale of I Heart Linen. Rashida's blog was one of the first few I started to read 4 plus years ago. 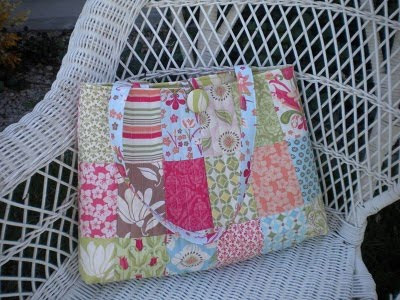 And her book "I Love Patchwork" is fabulous. These fabrics are a mix of patterns and designs from several manufacturers and lines but mixed together and picked out by Rashida. 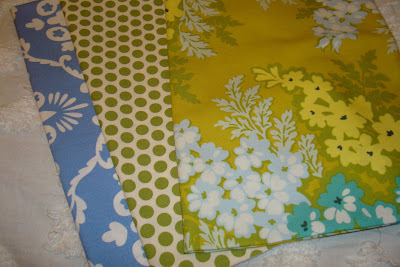 I appreciate mixing and matching fabrics from different lines. I think it adds more depth to a project. Look Ma. No Red! I love all these fabrics and it is a stretch for me to have red instead of blue with yellow and green but I think the prints are so special that I'm happy for the change. This blue in the middle is stunning. And I think the 3 are really beautiful next to each other. 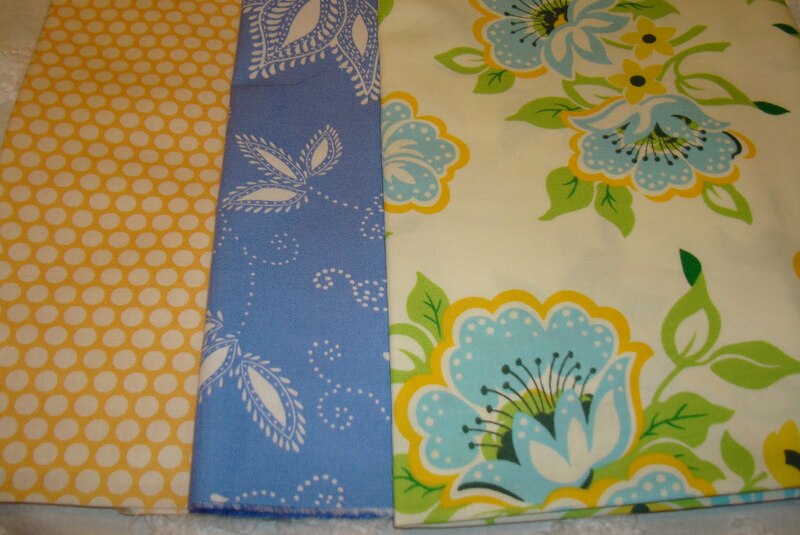 I already had a fat quarter of the floral on the right but I used most of it already. So I was happy it was included in this mix. 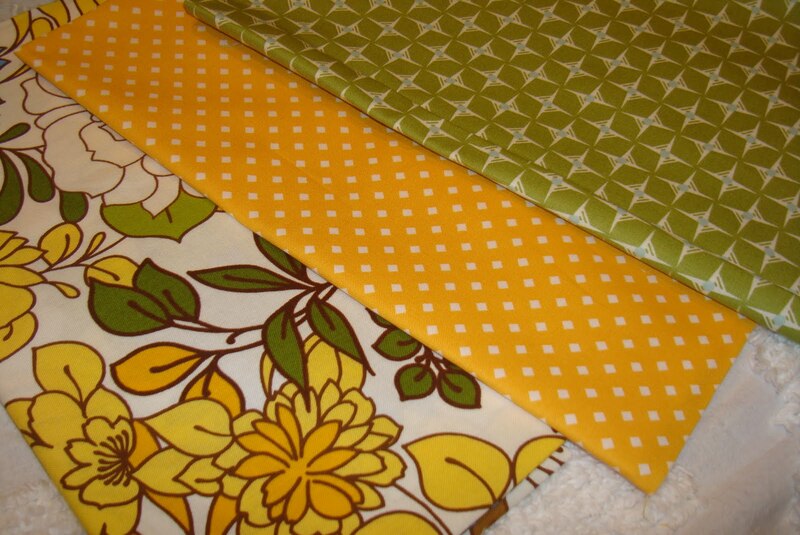 The deep yellow on the right is voile. 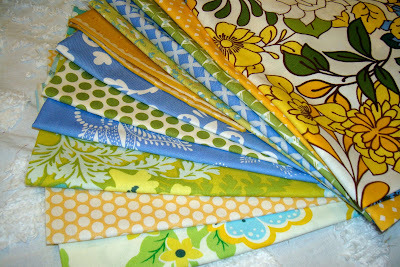 I am excited to see voile come back on the fabric scene. Some of my favorite dresses from Jr. High were made of voile. One thing I love about all these fabrics is the mix of scale. That is really important to me. I usually try to include both large and small prints in my quilts. 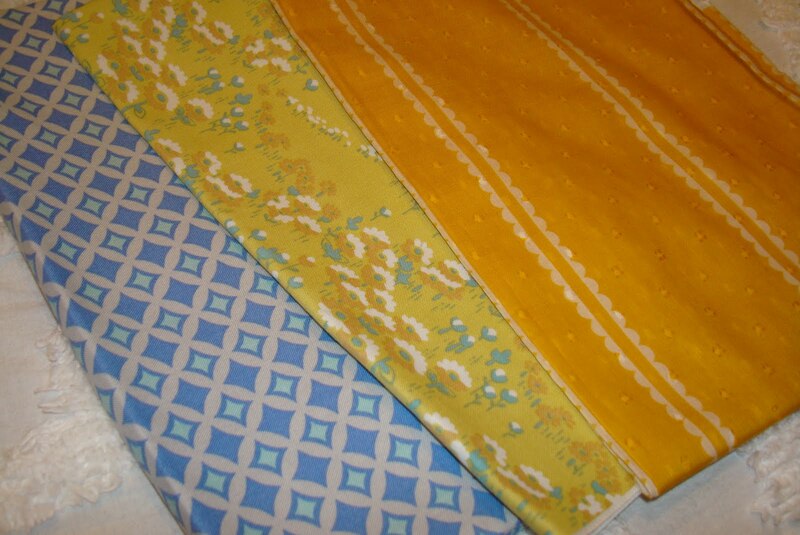 I am dreaming of making something with these fabrics. They are rich and lovely. I heart fabric. 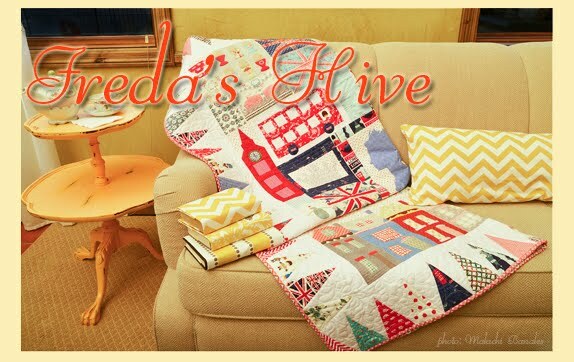 I met Konda of Moose on the Porch Quilts last year at the Bryce Canyon retreat. Konda and I were both teaching classes and very busy but had a few moments to mingle. 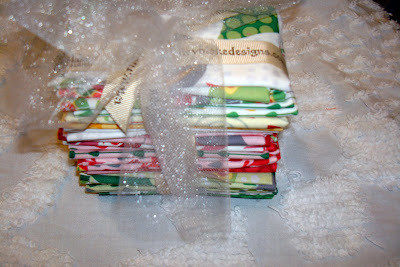 I really enjoyed her trunk show and hearing about her journey in becoming a quilt designer and book author. She's impressive. Because of pregnancy Konda didn't come to Bryce this year and I missed her! You can see her wonderful books here. 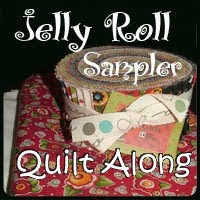 Konda is hosting the Jelly Roll Quilt Along and asked me to join her as a guest designer for one of the blocks. Of course I jumped at the chance. And it isn't too late to join us. We are just 2 blocks into the sampler and a new block comes out every 2 weeks. Even I can handle that and keep up! Doesn't everyone have a jelly roll on their shelf that needs to be used? 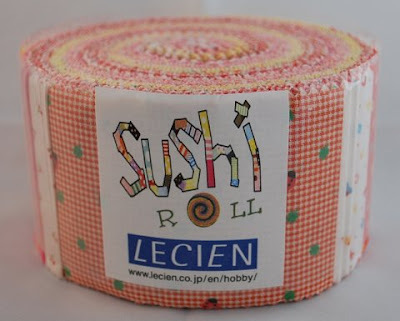 I recently acquired a Mini Muu Lecien Sushi Roll. The Sushi Roll is just very slightly wider with a few less pieces in it than a jelly roll. So I have to trim off a tiny tiny sliver of fabric but I don't mind that at all. 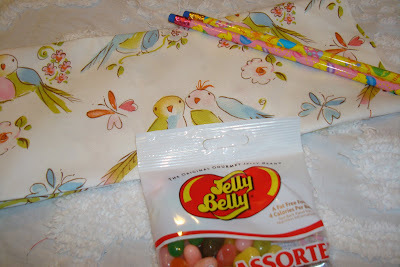 The instructions also call for a background fabric to be added to your jelly roll. So I chose this strawberry print. 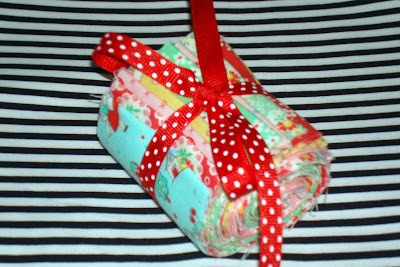 And since I will need some extra strips I'm adding this little fabric candy that a *friend* sent to me earlier this year. It goes perfectly. So this is block #1. You can find the instructions here. It is designed by Konda herself. It is easy and really fun. You can make it in less than an hour. This is block #2. You can find the instructions for this one here. 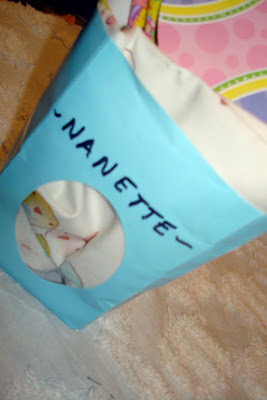 It is designed by April and was also fun and easy to make in under an hour. Ha, I just saw my stripes are not in the same direction. Oh well. I'm not redoing it. Sorry for the fuzzy sneak peek. This is the block I designed and mine will be block #6 with instructions out on May 10. Come on and join us! There are prizes and also a flickr group started to see what everyone is making. Dust off that jelly roll. It isn't a time consuming project and if you keep up it will NOT become a UFO. You can grab the button on my side bar and post it on your blog. 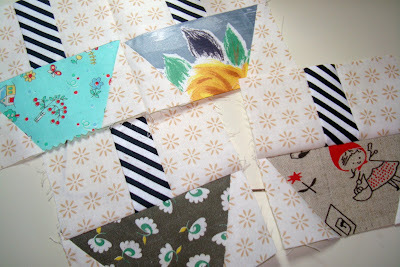 And even if you don't have a blog or join the flickr group, you can still sew with us. Come on!! There are 3 projects I'm working on right now that I can't show you. Of course eventually you will get sick of hearing about them. Little bits of 2 of the 3 projects are below. 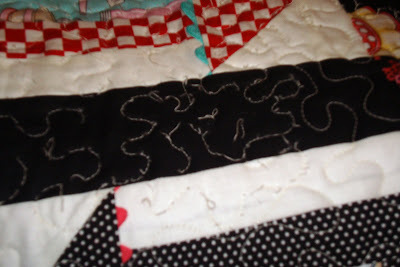 This is tiny piece of an idea for a quilt that is just at the mock up phase, but it may be published, we'll see. This is part of a project that may just show up at Quilt Market this spring. More of that same project. Yikes, my applique doesn't that great at this close range. Anyway, we'll see how these things progress and with some more efforts and a bit of time they may just work out. 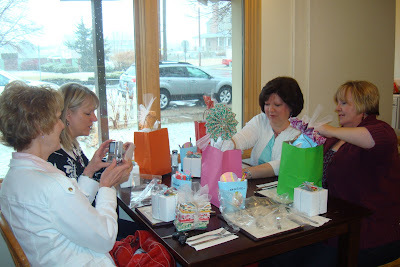 Last Saturday was lunch with the girls at "Food For Thought" in Draper, Utah. A mom and pop place with a delicious (healthyish) from scratch menu. It was really fun to see everyone and catch up. Left to right are Rae Ann, Nedra, Kim and Lori. We really have a guilty pleasure habit going on where we exchange gifts when we meet together. It is fun and I always come away feeling kind of giddy and silly with pleasure from the fun and treats. Here are some of our prizes lined up on the table. These are from Rae Ann. 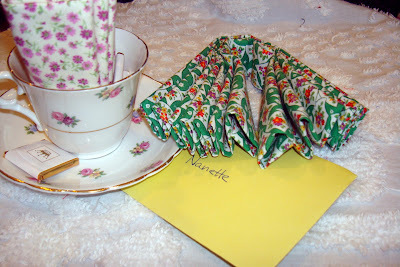 Rae Ann picked out a personal teacup for each of us with fabric to match the teacup and then fabric tied in a bow on top of her bag (and chocolate). Rae Ann is so thoughtful. 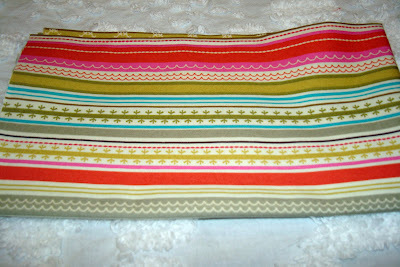 Lori brought us this amazing new fabric from Riley Blake Designs. She grabbed it hot off the bolt from Jina herself and Riley Blake and brought us each these fat eighth packs in all the color ways. Oh my it is just so lovely. I love the colors and prints in all the colors. 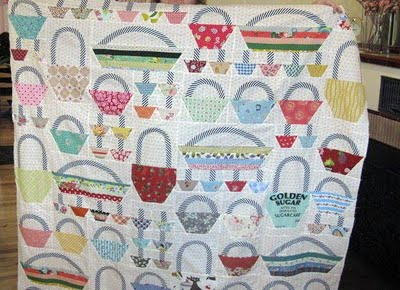 Lori thought it would be perfect for my April Showers quilt. I totally agree. I want to make another one now! Here are the pinks and reds all lined up. This really is my very favorite lines from Riley Blake. A goodie bag from Nedra. It got a little squished getting all my presents into the car. Inside were Easter Treats. Can you believe Easter is really only 2 weeks away. I'm glad Nedra got me thinking about Easter. Cute stuff. 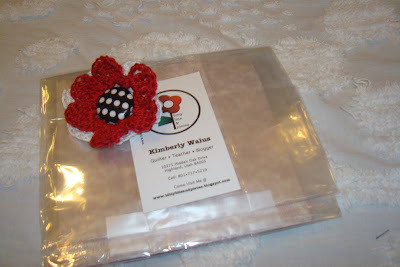 This is a little charm package from Kim with a crochet clip for hair or pin. I love the red and black dot. What could be more perfect from Kim than reds? Love them. Red and white is so classic and clean looking. Thanks to my 4 friends. I love my treats and it was so fun being with you for lunch. 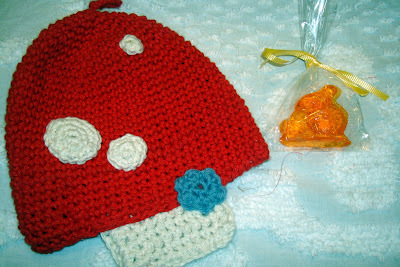 When I left "Food for Thought" I browsed their gift area and bought a little clear toy candy (remember those?) and a hotpad. The mushroom will be cute hanging in my kitchen. 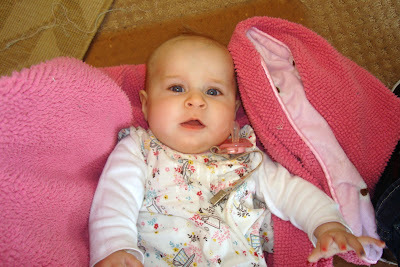 Here is baby Allison. She's growing so fast. Look at her cute cute top. I thought I'd show the fabric in her shirt up close. It is from Old Navy. 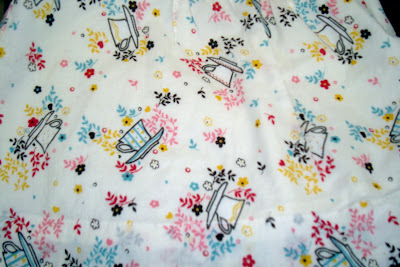 The fabric is so darling that I wanted to steal her little shirt. I wish I could get yardage of this but I couldn't even find the top at their website. Look at the detail. Too bad the little shirt is so small or I might be stealing it. Last weekend I was able to have some solid sewing time and work on my basket quilt. I saved the little baskets to work on last and they went together so fast and were so fun. It was definitely the way to go for me, saving the best for last. 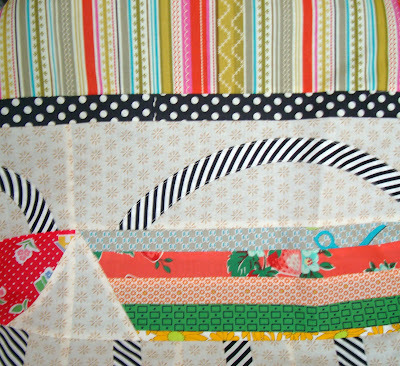 Sometimes sewing pieces together to finish a quilt can be tedious, but not this quilt. I had a great time piecing the parts together. Maybe because it wasn't row by row but the baskets are put together in units and then the units sewn together. 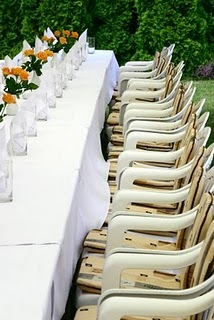 I like this idea so much that I may use the unit concept for one of my own future patterns. I needed to move onto other projects so I decided not to piece a piano key boarder but used my Michael Miller stripe to create a pieced boarder look. I was happy with the final results and now I can't wait to get it quilted. 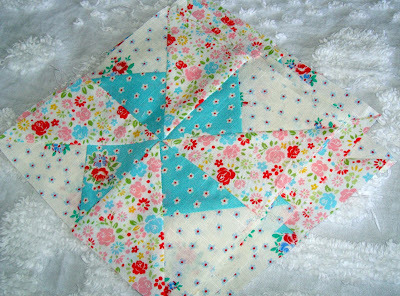 I'm not sure what direction to give the quilter but I think the flimsy needs dense quilting. 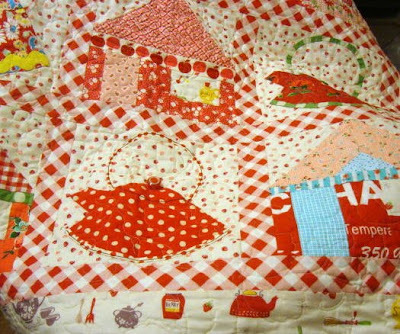 I really enjoyed this quilt and I highly recommend it to you if you are thinking about making it. The directions are a little odd so I'm glad I took a class to start it. Some of the handles were time consuming but it came together well. Amy is working on her own version. Amy's is going to be fabulous. 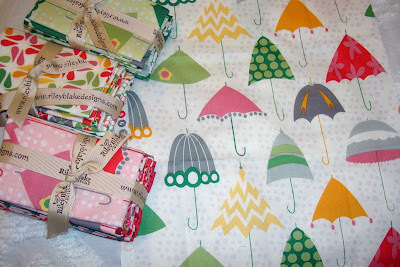 I love her fabrics! Now that things are settling back a bit to normal at the hive (well, what is normal? ), I'm excited to talk about another quilt retreat occurring June 9-11 in Panguitch, Utah. It is called The Quilt Walk Festival. And you can read all about it here. The quilt walk has quite a history and a reason behind the name. I've only been once before but this year I'll be teaching along with some other amazing ladies like my friends Nedra, Brenda, Konda, Leslie & Norma, Joyce, Bonnie, Emily, and SOOO many more great teachers. I urge those that can make time in their schedule to do so quickly as registration is taking place now. 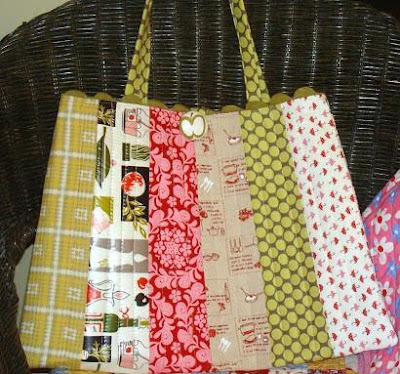 I'll be teaching my "Mixed Bag to Quilt" class. This is an easy bag in a great shape. I swiped this pic from Sherri's blog. Sherri is the queen of Mixed Bags. 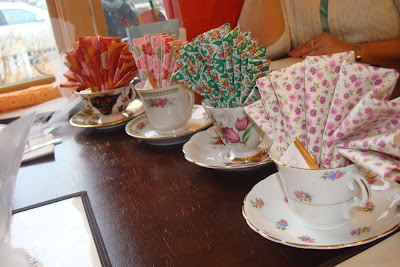 She has made so many of them and she uses charm packs to make the strips. So clever. 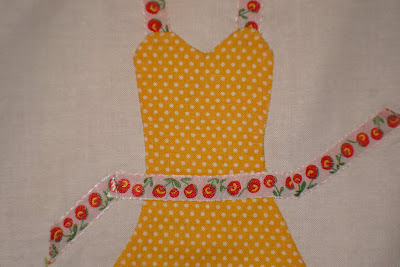 I'll also be teaching my "Kettles in the Kitchen" which uses applique and easy construction. 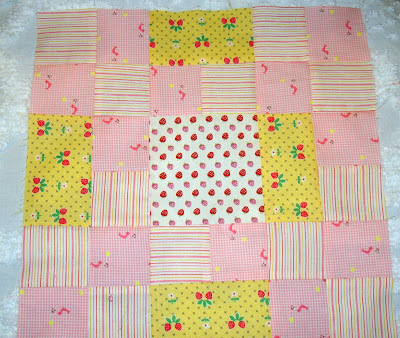 There are 2 sizes for this quilt and it too is easy and fun. No matter which classes you take and from whatever teacher I know you'll love being in Panguitch in early summer. 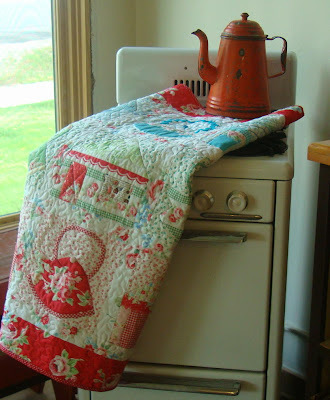 Think ahead to June and come to Panguitch and quilt with us! I love cherries. Don't you? There is something so sweet and pretty about a cherry. Not to mention delicious. Healthy, too. My sweet friend Nan (yes we share the same name!) sent me a little cherry surprise yesterday. She's so kind to me. 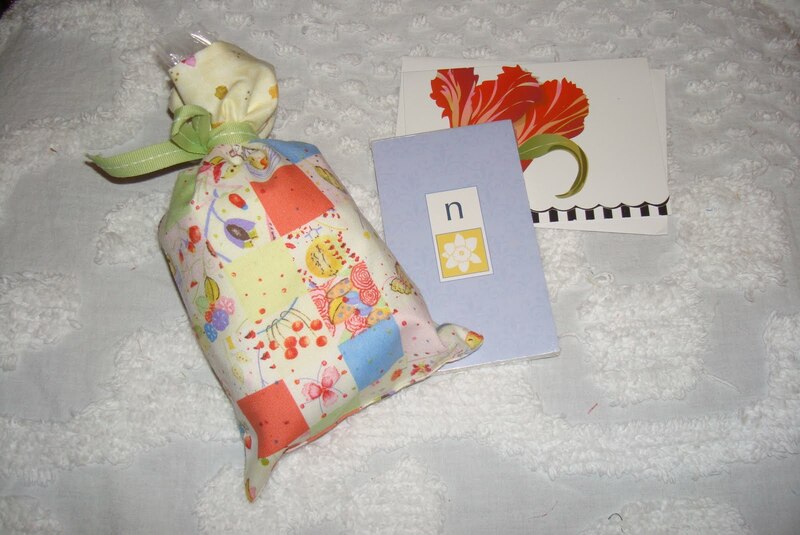 Nan is thoughtful and a writer, chef and quilter. How great is that. 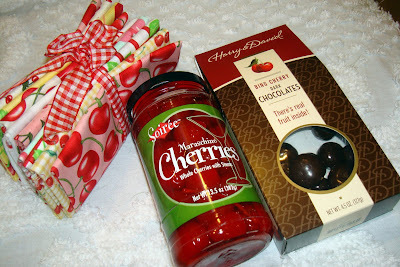 Well not only do I have the great fabric but gourmet cherry chocolates and maraschino cherries, too. Thank you so much Nan! 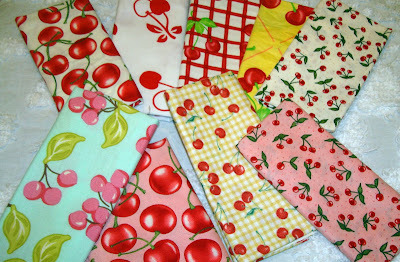 Nan said she thought of me when she saw the bundle of cherries fabrics. They are all very cute and playful. 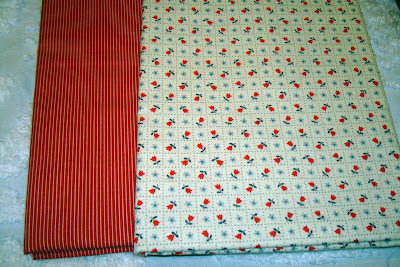 It is coincidental because I have a project on the horizon (secretish) that uses cherry fabric. 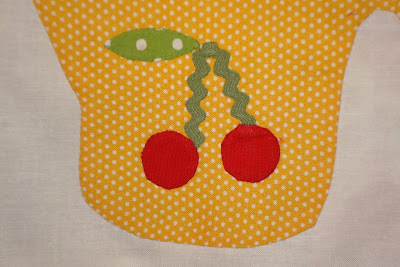 In the mean time, I'm going to have to put some cherries in my little baskets I'm making right now. I laughed and laughed at the card Nan included in the box. It is so true. 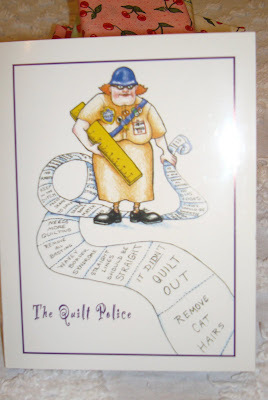 These are all things we fear the quilt police will charge us with! You're such a fun, thoughtful friend, Nan. So to round out my Fabric Friday I thought I'd include these sale fabrics from Fat Quarter Shop above. I'm going to use them in my block-of-the month Alpine Group quilt. And this Michael Miller fabric I just had to have a half-yard cut from. I love fabrics with interesting stripes and scallops. This one is just great. I might have to make a basket out of it AND also put it in my block-of the month quilt. I'm making the block of the month quilt-a-long with our Alpine Group. 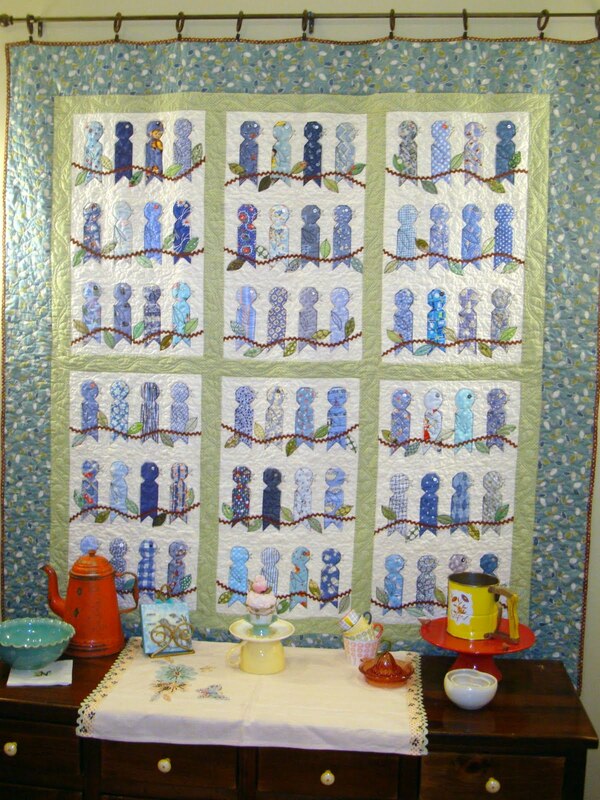 The quilt is designed by Jina Barney. And I'm really having fun with it. Last year I got behind in our 2009 project and I won't let that happen this year. No matter what I'm keeping pace with Jina. 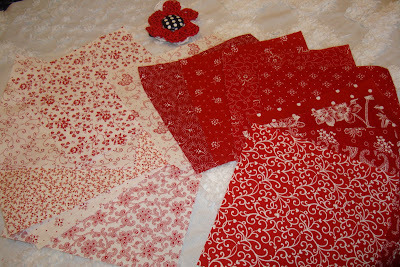 You can find the pattern for this month's block at Jina's website here. This month being March, Jina designed a pinwheel block to add to our progress. 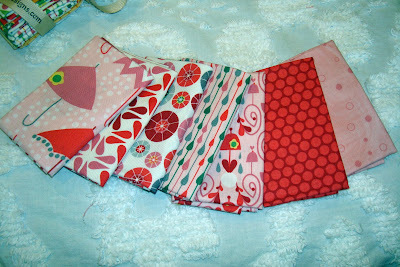 I love being able to making the blocks and sewing them to the other blocks immediately. 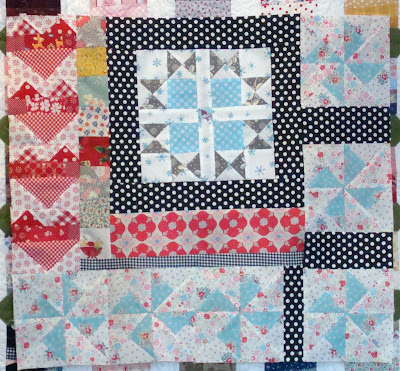 So here is my quilt so far. I've pinned it over another quilt on the wall to keep it in my mind at all times. 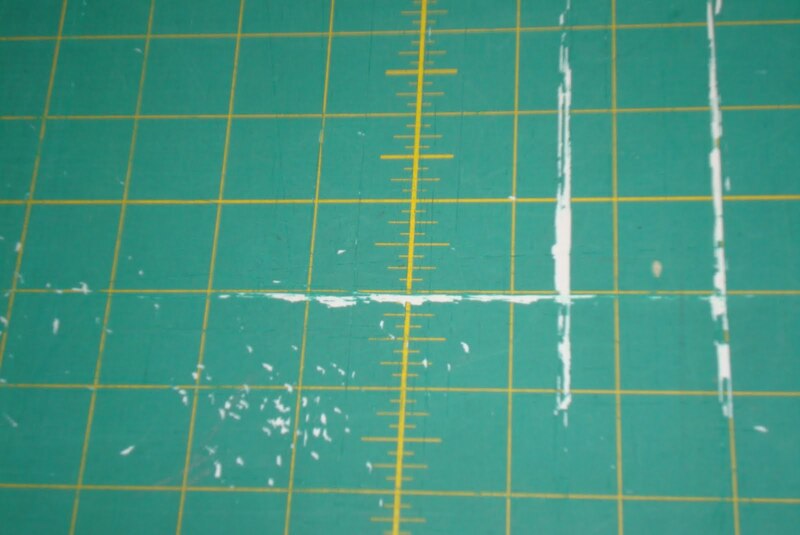 I'm not so sure yet about the black and white dots I put as filler strips. I have been thinking about taking them out. 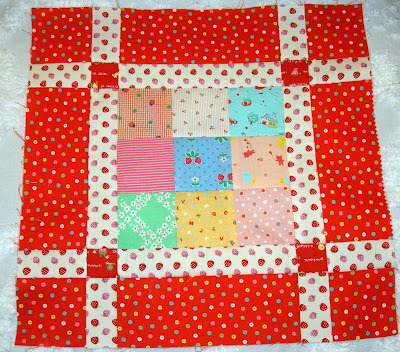 But I want to use black and white dots here and there in the whole quilt so it is hard to judge at this point if it will balance out or not. Hopefully it will. 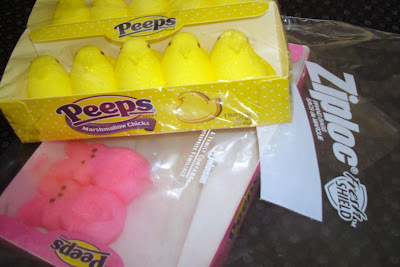 My sweet friends down under had lots of questions about Peeps. 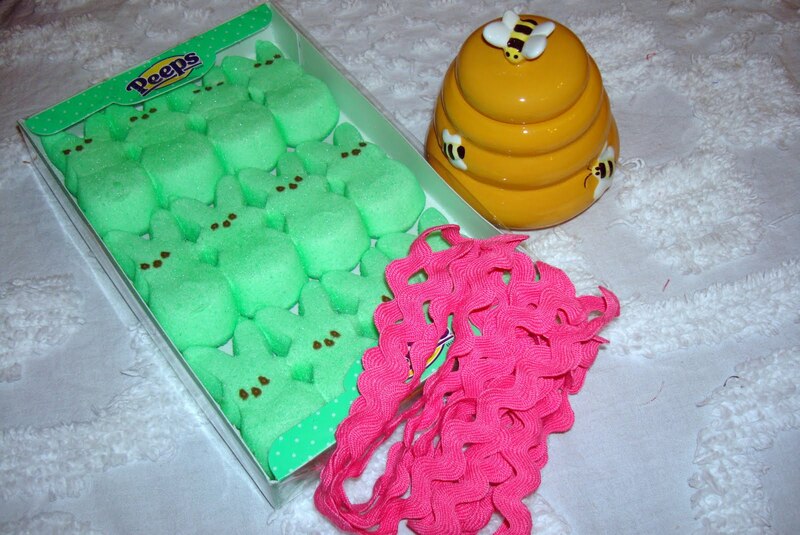 You can read about Peeps here (beware, there is crazy music). But I'll tell you what they are. They are a frothy marshmallowy confections with a granulated colored sugar outer coating. They kind of melt in your mouth. I like them soft allover or just a little crunchy on the outside but soft in the inside. So a couple hours with the package open will give the crunch. Some like them harder. It is an acquired taste. Individually they are quite a sugar punch but if you just eat one they are only 28 calories. Not too bad if you can contain yourself. They used to just come out only at Easter time as an Easter candy but they've been making them for most holidays in other shapes other than chicks and bunnies. They even make them in chocolate covered. Fun to eat. I did put mine in a zip lock bag (after reading your suggestions) and now I can space out the sugar rush and have them stay fresh. 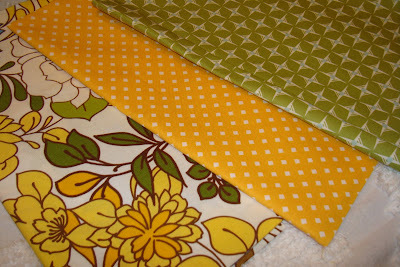 Fabric Friday and surprise - no red!